1983, and the alcoholic British palate is evolving at a rate of knots. Wine has finally arrived! After a decade of swilling sickly bottom-end Eurobrands like Don Cortez, Mateus and Goldener Oktober, aspirational types from all walks of life are developing a taste for the sort of hard-to-pronounce south-facing plonk at which the continentals themselves wouldn’t turn up their noses. Cosmopolitan wine bar sophistication is triumphing over beerily parochial snug bar ignorance. A longstanding cultural barrier between the United Kingdom and her mainland neighbours looks set to be toppled for good. This simply won’t do at all. To the rescue come G&J Greenalls, Warrington-based spirit manufacturers, who’ve acquired (ask not how) a job lot of questionable vin de table, and are looking to shift it in those lovely new three-litre wine boxes to the sort of honest British boozer who still thinks Bordeaux is a JRR Tolkein character. And who better to demystify the pretentious verbiage surrounding viniculture than good old Willie Rushton, avuncular humourist of benevolent media ubiquity, and the sort of good egg who’ll run off a few telly ads in return for a couple of crates of agreeable liquor, no questions asked. So was born Naughty French Wine, the swillable paintstripper of choice for the red-nosed EEC-phobe in your life. 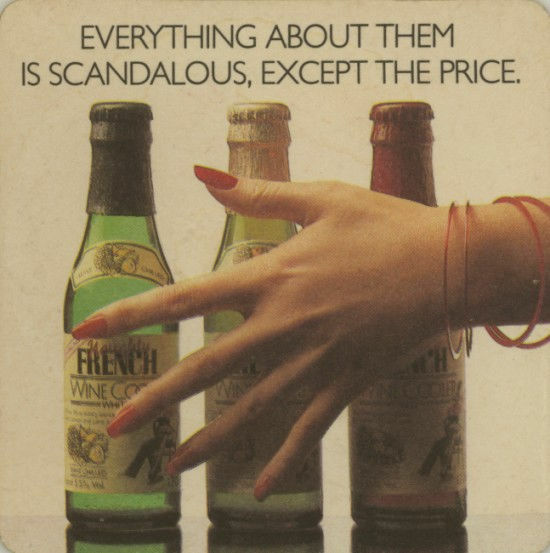 The premise: well, those Frenchies are always, you know, “at it”, ain’t they? And you know what makes ’em so randy, don’t you? Well, here’s a clue: it ain’t the cheese. So knock back a few pints of this with the missus and Jean-Paul’s yer Sartre, comprendez-vous, if you’ll pardon my French. Thus, the sainted Willie finds himself in beret, cravat, and too-tight onion-seller shirt, making a reasonably convincing plea on the telly for ale-supping Brits to put aside their inverted snobbery and enjoy wine for what it is. Throw in Vicki Michelle as one “Fifi” to perch on the great man’s lap, and the weird double message of “Hey, wine is nice, don’t be scared!”/”Phwooooaaarrr, those continentals, eh?” is made manifest for all to see. Rushton, in true gentleman-dilettante fashion, even mucked in to write and illustrate a free promotional book, detailing a fictional tour of France’s wine regions in the company of a pisshead sales rep: a sort of wine-and-cheese version of Fear and Loathing in Las Vegas. Sadly, the message didn’t take off quite as Greenall’s hoped, and the most daftly-named beverage ever seen on UK shelves was soon making its own small contribution to the Common Market wine lake. Rushton, meanwhile, simply chucked out the beret, dusted off his trusty Panama, and thumbed a carefree lift back to the Jackanory studios. All in a day’s work, madame. Have they been to Liquorsaver?